Yes I admit, I totally gave in and started another project. To be fair though, I found the perfect yarn for it a few weeks ago and it was calling to me (seriously, I swear!) I’ve had my eyes on this project years ago, so I feel like it’s okay to have started it now 🙂 I know I’m a bit late to the party, but I’ve finally started a virus shawl. 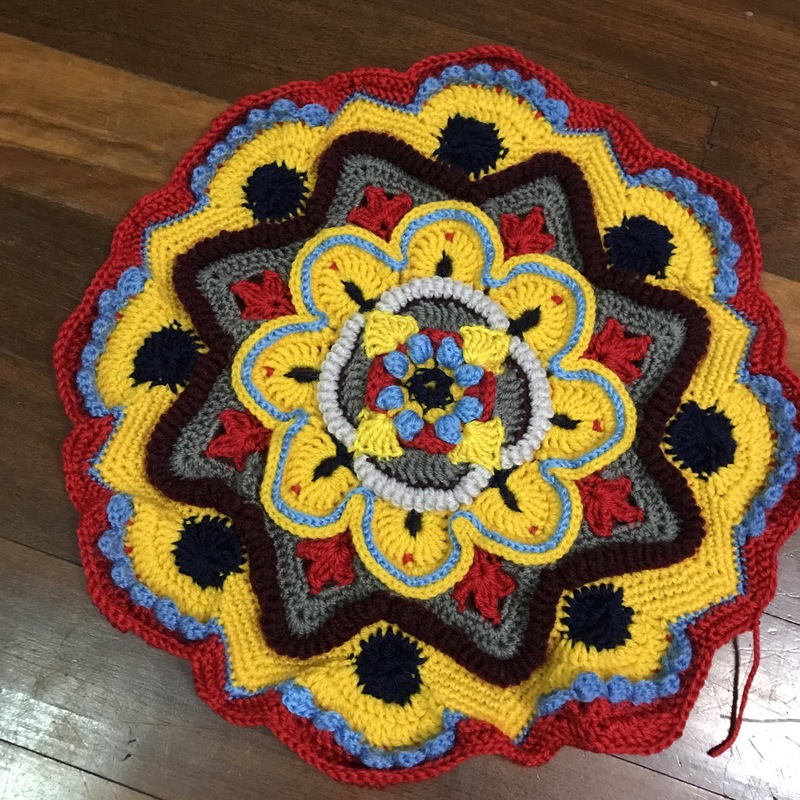 I even enjoyed some outside crochet time yesterday, before we got hit by the rain and wind brought by cyclone Debbie. 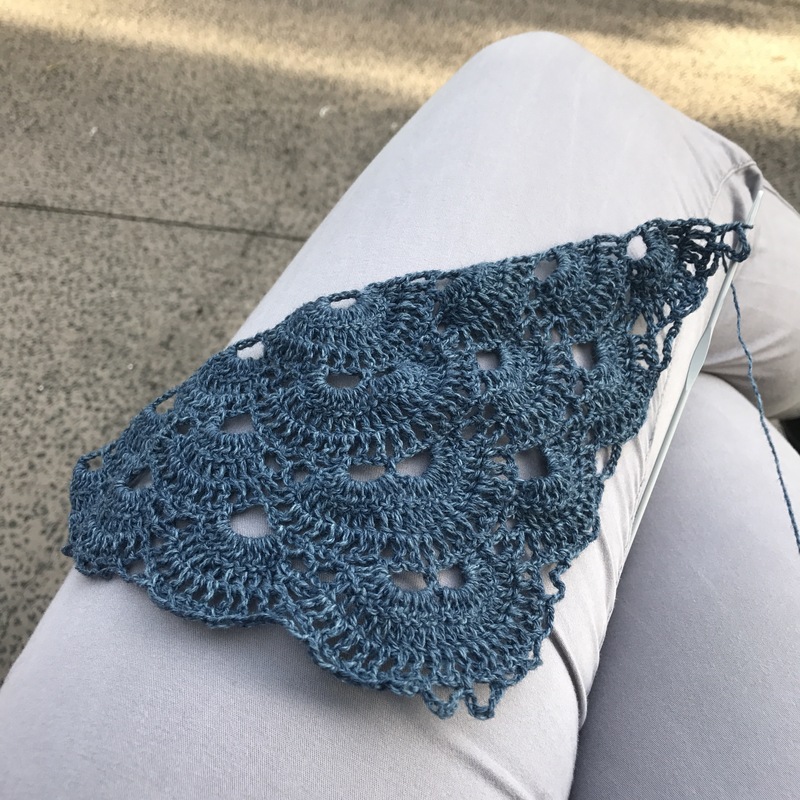 I really love the pattern for this shawl, so easy to do, I don’t even have to think about it. I’m using the most gorgeous yarn too, Holst Garn Coast, and I love the slight changes in colour, it makes me think of denim 🙂 so pretty! Anyway, I’m going to take it slow with this one, and try to update the mandala madness next week instead. We will see how I go! P.S. I also just started a secret project today. I might show you some sneak peeks next week 😉 and yes, I know I should really finish stuff before I start new things but I can’t help it! Last week was very busy for me, and I got the lovely surprise of getting nominated for 2 blogger recognition awards! Thanks a lot Tami and Nina, you are wonderful and you really made my week! If you haven’t checked their blogs, you really should, both ladies are extremely talented. 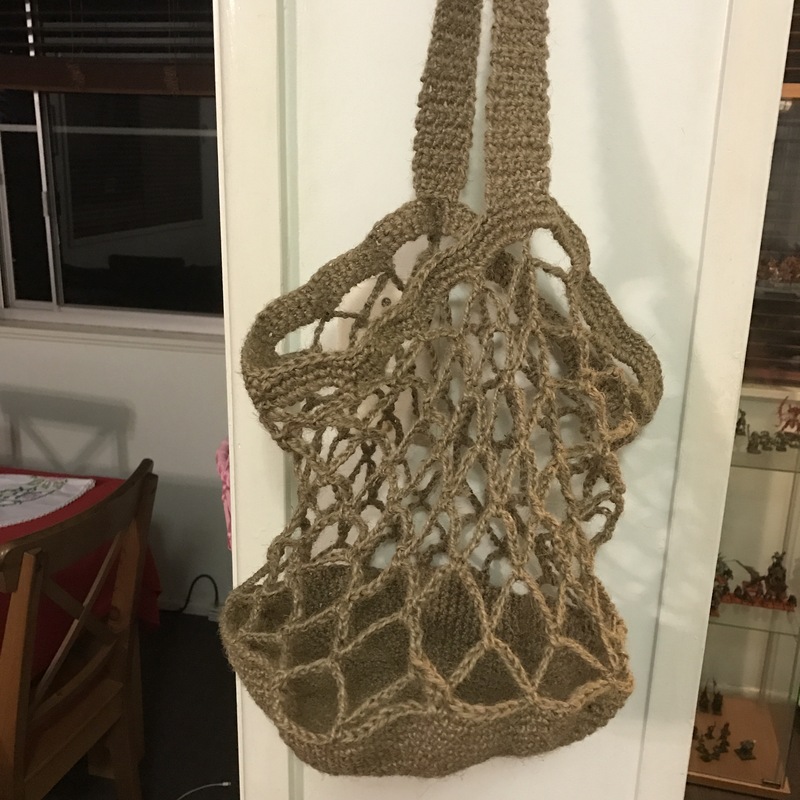 Nina’s purses are just the cutest, I really love all her designs, and Tami shares all her crochet projects, and most of them are linked to youtube tutorials, so you can make them too! I first started my blog as some kind of personal diary for my crafts. I had only just taught myself crochet (in the few months before starting) and I was about to tackle my first big project, a mystery CAL! I thought blogging would keep me accountable and would help me catalogue all my projects. 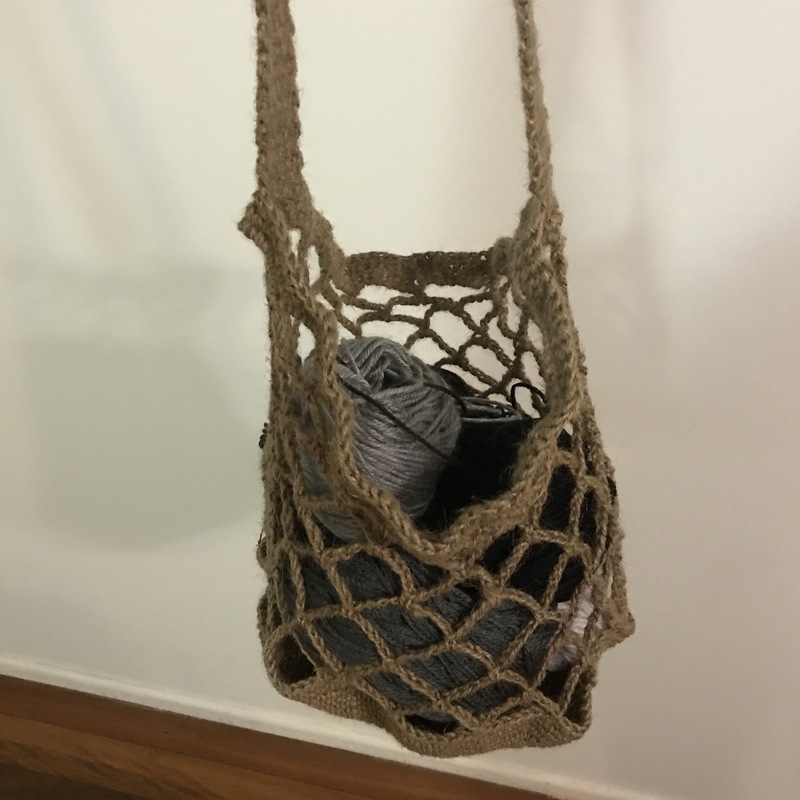 Not only did it help me finish my first blanket (yay!) but I also found such a great community and inspired me to start designing some projects of my own. Keep true to yourself, if you are passionate about what you write, it will show through and people are more likely to enjoy your writing. Also, you will be less likely to abandon your blog after a few months because you are writing about something close to your heart. What will you receive? 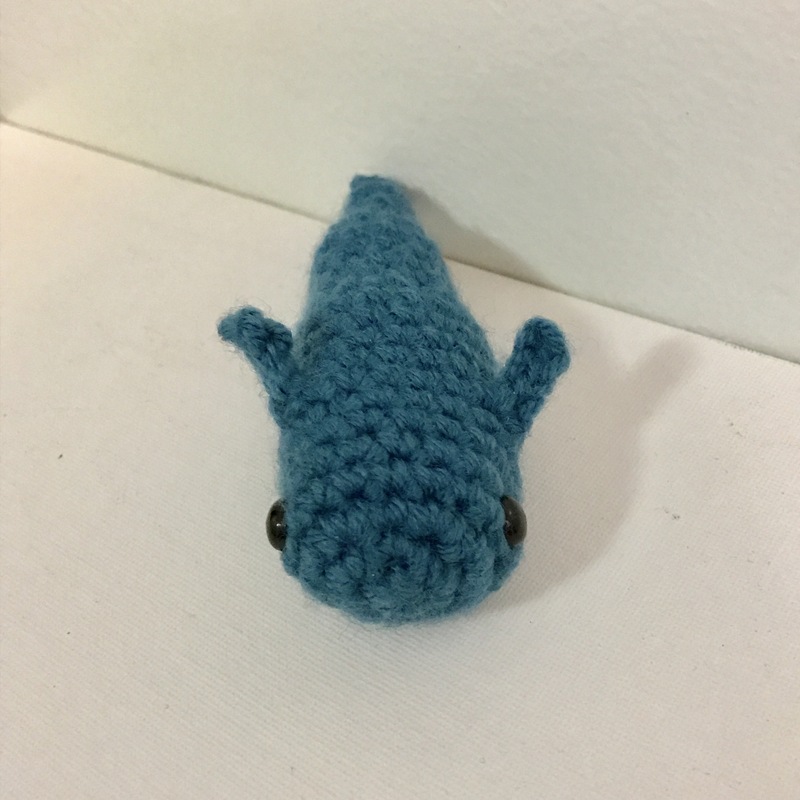 For this giveaway, I’ll be sending one of my Millie the Manta Ray plush toy – you can let me know which colour you’d prefer and I’ll make it for you (also if you have small children I can embroider the eyes rather than use safety eyes). 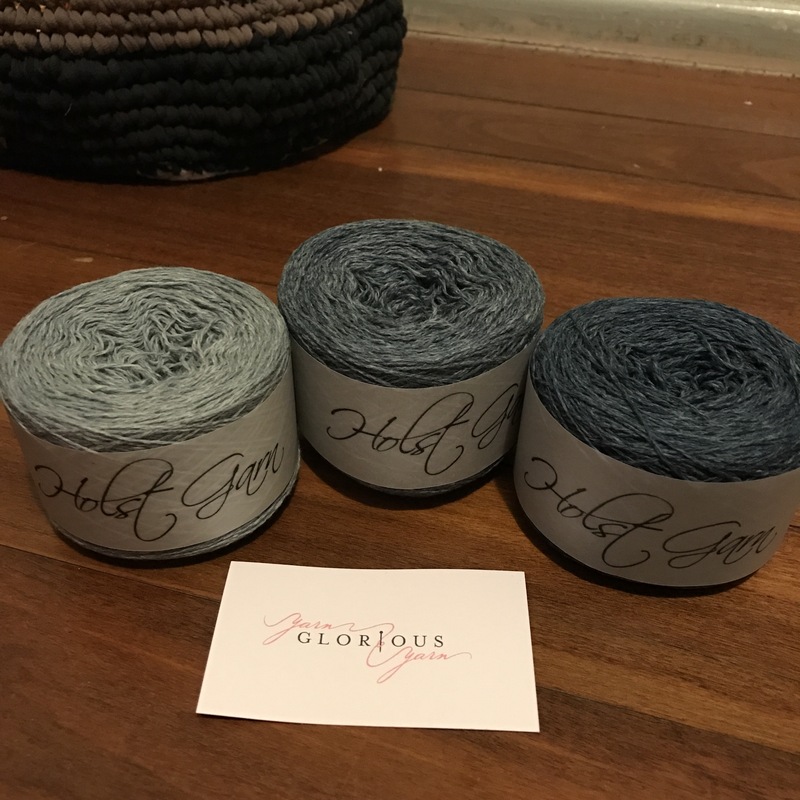 I’ve also got some gorgeous yarn bought from mini haul at Yarn Glorious Yarn. And finally you will get a cross stitched bookmark made with my latest design (soon available on my Etsy). This giveaway will be open until Friday the 24th of March, 8:00 pm AEST (Brisbane time), and the winner will be selected randomly from participants. Good luck to all and thanks again so much for reading me! 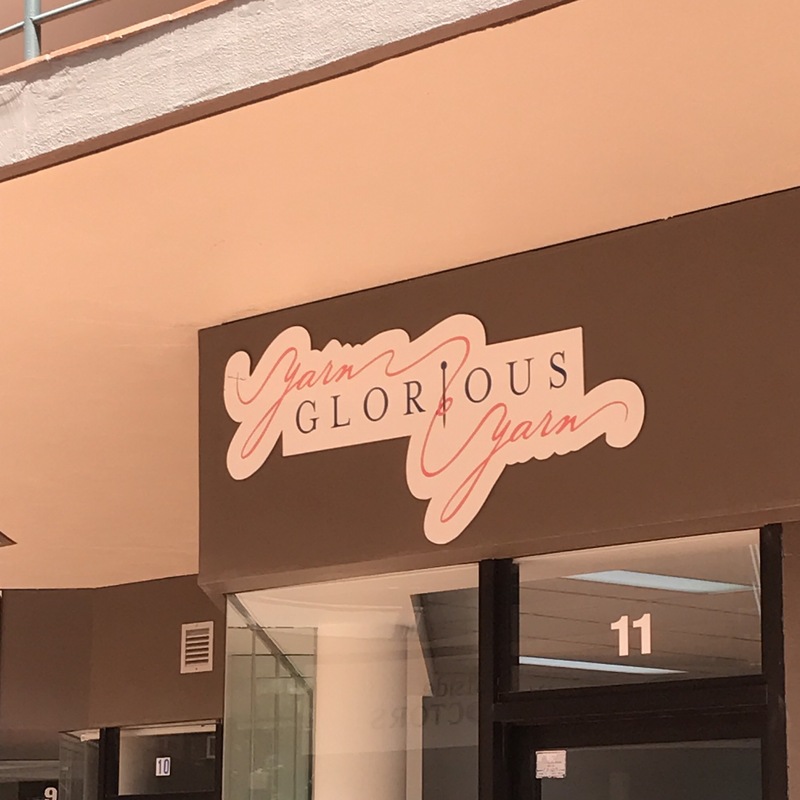 Last weekend I felt a bit adventurous and decided to finally visit the yarn shop ‘Yarn glorious yarn‘. I had heard about them from a few different persons and I also saw them at a craft show last year but never really made the time to get there. Saturday was different, I finally stoped at the shop and I really wasn’t disappointed! Of course, I had to buy something, so I set my choice of this beautiful light weight merino/cotton blend. All the opinion expressed in this post are my own, I was not paid or compensated in any way for this review, just giving my honest opinion on a shop that I really enjoyed. Sometimes, I really feel like I have issues focussing on only 1 project at the time… I know that many of you feel the same way, so at least I’m happy that I’m not alone. I’ve discovered recently that I really like making my own amigurumi. 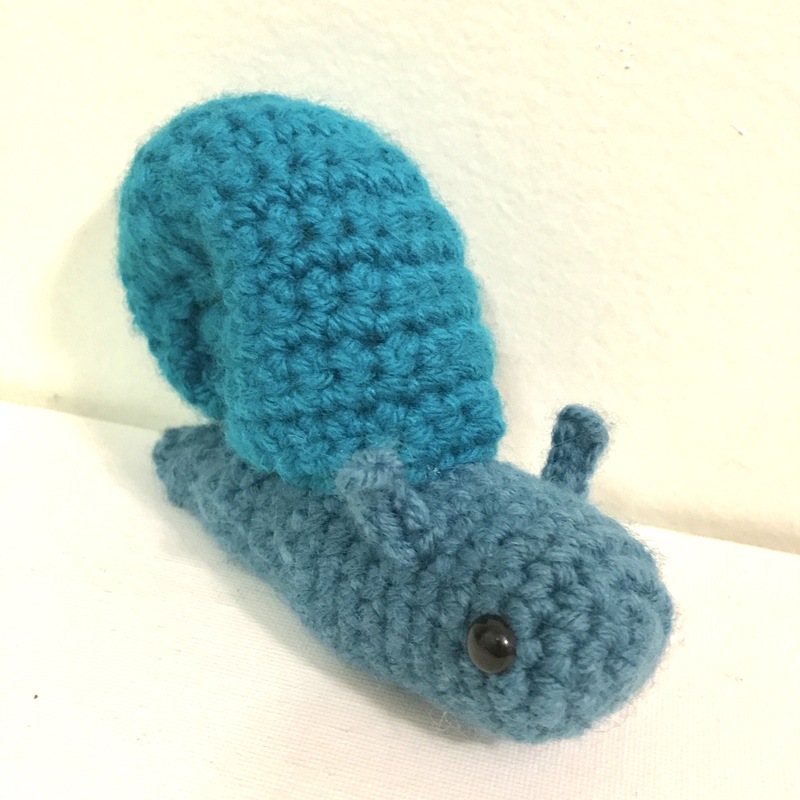 So, when I feel unmotivated with my bigger current projects, designing new, cute crochet toys seems like the perfect alternative! 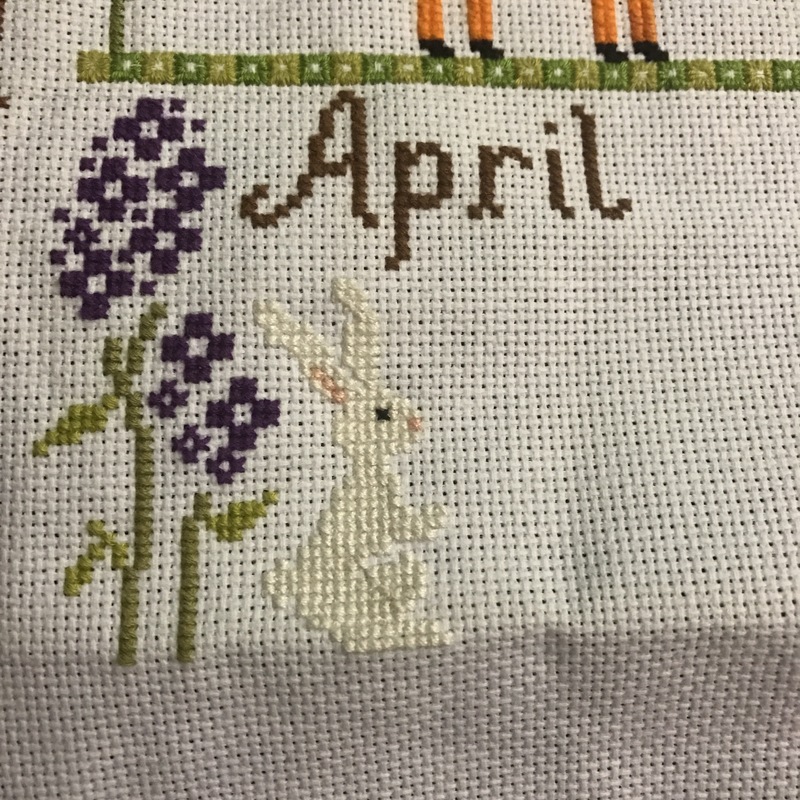 This only took me a few hours in front of TV, and I’m hoping to write a pattern for it soon. 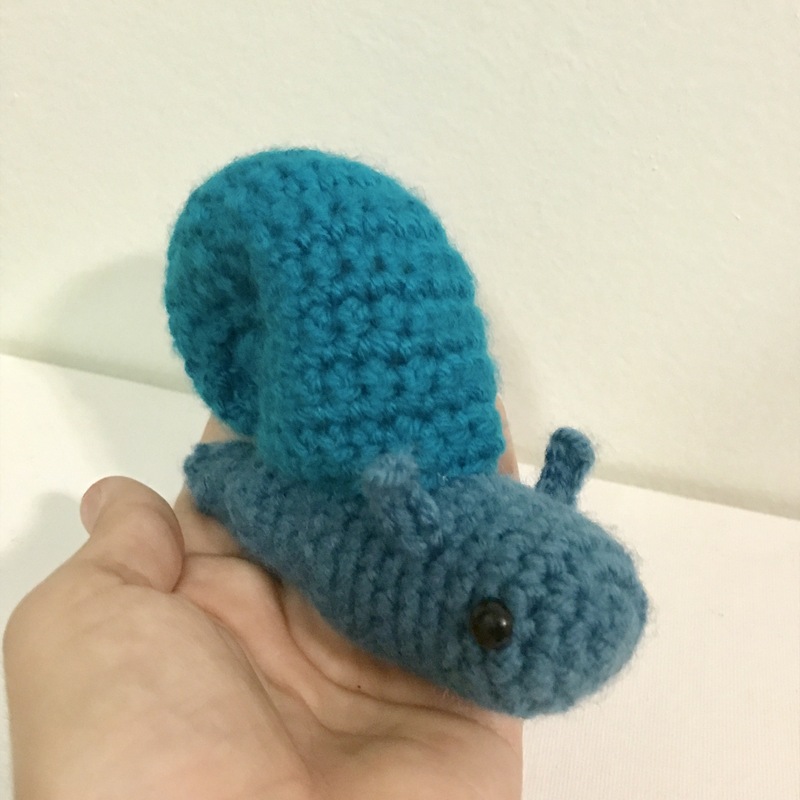 This little guy started out as a slug. 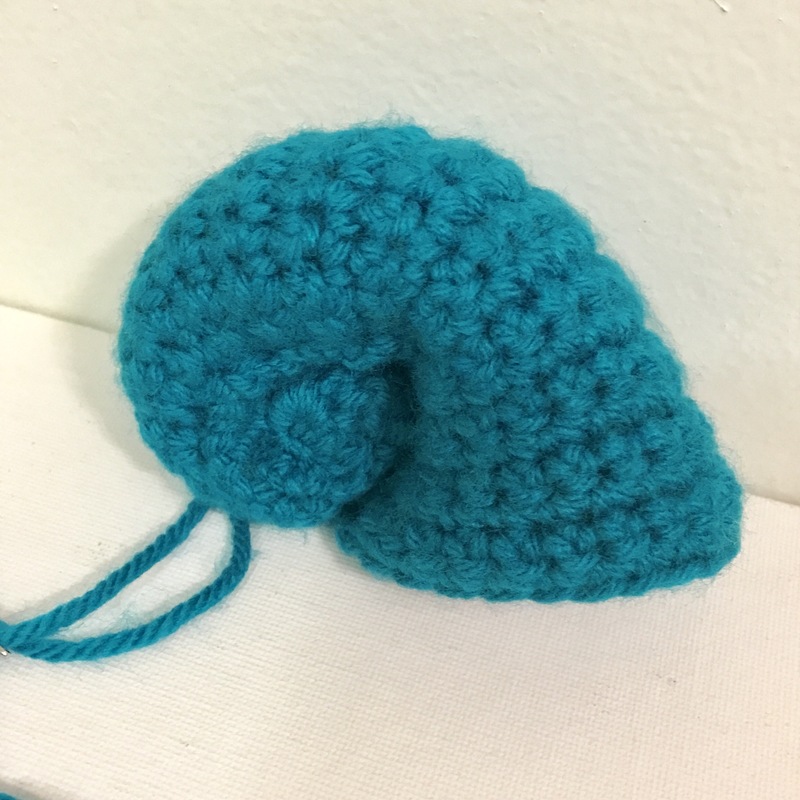 But I had planned on giving him a house to bring along, so I set out to crochet a shell. What do you guys do when you’re getting bored with big projects? Power through of get distracted like I do?